Base Pantry’s two drawers exactly right for you when you choose from several drawer inserts. A Message Board for your Pull Out Peg cabinet is available to order separately. Measures 85/8” x 141/8” x 1/2”. SMART DESIGN The style and number of hooks included will vary, depending on the cabinet ordered. All hooks are available to order separately and are illustrated above. INFINITE ARRANGEMENTS! Three possible arrangements are shown above. 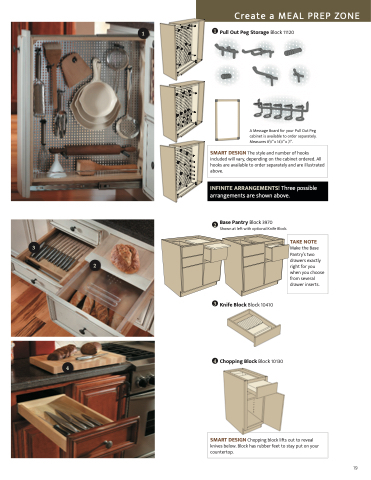 2 Base Pantry Block 3970 Shown at left with optional Knife Block. SMART DESIGN Chopping block lifts out to reveal knives below. Block has rubber feet to stay put on your countertop.